Professor Swenson has big problems: he hasn't published a follow-up to his last very successful book; now six-years-old, his daughter barely speaks to him; and he's having second thoughts about the strength of his twenty-plus-year-old marriage. 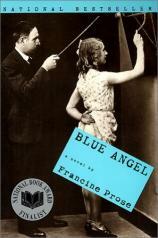 Add to this a talented and seductive writing student who fawns all over him and begs for his attention to her burgeoning talent and a new campus policy about sexual harassment that backfires on him, and you have Francine Prose's new novel BLUE ANGEL --- a tragicomic look at the small-minded politics of academic communities and the price one pays for artistic inspiration. The title for BLUE ANGEL comes from the film of the same name in which Marlene Dietrich, as Lola Lola, chanteuse of Weimar Republic dance halls, seduces and then steps her high heels all over the body, mind, and spirit of a lowly professor who adores her. Swenson, once his teacher-student relationship slips over into sexual fireworks, is on a chart for destruction as his obsession with his mysterious and bravely talented young student takes over his life. BLUE ANGEL exposes the difficulties colleges face with such teacher-student revelations and the lengths they will go to assure their boards that such demeaning circumstances will not be taken lightly on their campuses. Swenson deserves what he gets: he does get too involved with Angela, the young novelist, and puts everything he supposedly cares about at risk. In doing so, he finds a freedom he wouldn't have otherwise had the nerve to pursue, but leaves in his wake the corpses of those who suffer (and gain) from the deceptive power plays that rise from the situation. BLUE ANGEL works best on the level of a thriller: Will he or won't he, will she or won't she? Wading through the lackluster tome Angela is writing notwithstanding, the writing is smart and sharp --- I did not find BLUE ANGEL laugh-out-loud funny, although there were times when it did successfully reach for some comedy. The most compelling part of the book for me was the way in which all the female characters are drawn so complexly. No one is completely good and no is completely evil, and for that, Prose must be lauded. However, she draws some cartoony portraits of academics, which take away from the satire of the piece as a whole, and the ending is somewhat inconclusive. All in all, this tale of artistic and romantic desperation is like a feminist WONDER BOYS --- the aging professor-writer who finds inspiration and destruction in the body of one bright student. BLUE ANGEL is a well-written attack on academic hypocrisy and takes no prisoners in its criticism of self-protecting, self-promoting contemporary characters. Prose's fiction is always full of big relevant questions couched in very readable stories, and BLUE ANGEL is perhaps her best melding of the two in her long fiction-writing career.